Motorcycle maintenance is quite easy to do without breaking the bank. Here are the 3 thing you want to keep in mind. AIR INTAKE, OIL and HEAT DISPLACEMENT. I’m sure you’re already reeling the reasons why in your head because it sounds very simple. You would be very, very surprised how many people completely neglect these areas. Money may be tight and a new air cleaner or oil change may strike your wallet easily with a 100-150$ bill. I get that. Or maybe it’s easier to put off taking care of your ride’s needs because the damage that this neglect may be causing is hidden inside the metal casings of your engine. Never to be seen. You can’t see it, so it must not be happening right? WRONG. Not all but MANY people only pull the trigger on spending the coin AFTER it’s already broken. Unfortunately, you can easily double or triple your spending on repairs if you’re not consistent. I’ve even heard customers say with anger “Every time I come in here I spend 600$!!”. I never see them in the shop for fluid flushes or any preventative maintenance checks. Tires are worn flat out because the only time they check their tire pressures is every state inspection…… ANYWAYS, keeping a close eye on these three factors during the lifespan of your bike’s motor will help hold back the crippling effects of that good ole wear and tear. In a combustion engine (other than pressure) you need three things. Air, fuel and fire. We can rely on the fact that the fuel we pay money for to put into our gas tanks is for the most part, metered, clean, and reliable. We can also rely on the fact that sparks that are flying out of the bike’s ignition coils and spark plugs are contained, consistent and controlled. (hopefully). That leaves one last ingredient which happens to be left in the hands of imperfect humans. You and I. Air filters are designed to, well.. filter air. They come in many colors, shapes and sizes. Most use oil coats. Some do better dry. The important thing to take home to momma is that these filters are just as important as the air you breathe. Once air filters begin to either break down, fill with dust, dirt, oil, road grime and debris, it all begins to swirl around in your air box more then ever because the filtration compound is no longer accepting guests. 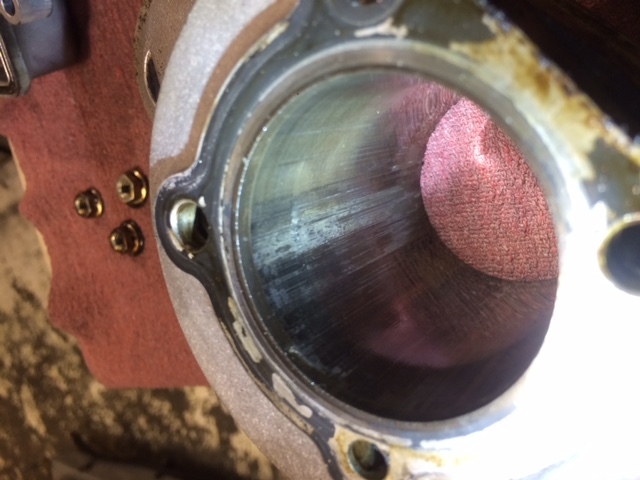 The pores are clogged with dirt that is already trying to make its way into your carburetors or throttle body from the vacuum of the motor. Air Filters are NOT 100% bullet proof. Particles will get by and enter the cylinder. Once dirt begins to enter the combustion chamber, it’s on its own. It can either be burned up and spit out or it can slowly seat itself anywhere on the cylinder walls, pistons rings, and valves or valve seats. This is NOT what you want at such an INCREASED rate. You can slow this type of wear down dramatically. One of my least favorite style air cleaners are the K&N style filters. This may hurt people’s feelings, but it’s my honest opinion. You’re better off using your tube socks. The only things I feel they can sell on, is the “I’M CLEANABLE” aspect of filters. I’ve seen many different bad outcomes caused by those filters. JUST MY OPINION!!….. mixed with facts. Here specifically is a piston skirt that was heavily worn by two major things: dirty contaminated oil (over time), and a very old aftermarket air filter on a four wheeler. Just because you can’t see it doesn’t mean it isn’t happening. 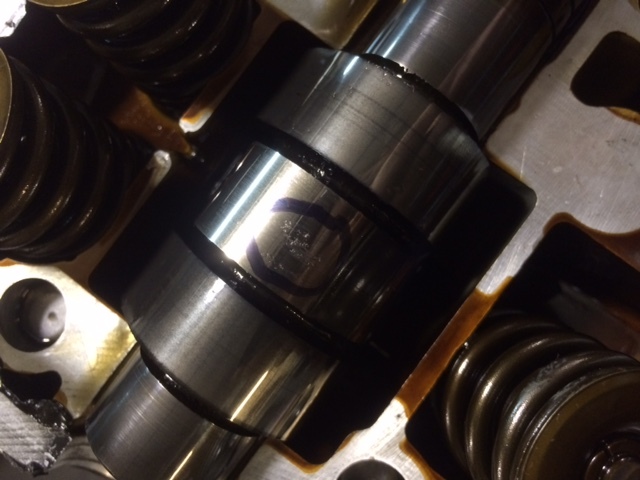 Here are two images of a camshaft and rocker arm assembly. The picture doesn’t show the full aspect of the depth of the deterioration of the lob and rocker mating surface but it was substantial. Continued use with these two surfaces in the condition here (as these two parts are in constant contact) would rapidly deteriorate further to the point of a possible wiped cam lobe or more metal material embedding into bearings and other surfaces. The is a direct result of contaminated oil. Because combustion motors are far from being 100% efficient due to heat, friction, and energy loss, metal parts as they are broken in with day to day use, lose some of their hard compounds and contaminate the oil. Oil filters are put in place to pick this junk up as well as any other dirt or blow that by is circulated through. Again, in order for motors to be 100% efficient EVERY aspect of its use must be perfect. Oil filters help tremendously, but are not perfect. The older it is and as more detergents are burnt up, its contents are less and less useful. Indeed the petroleum oil is still there. However, as your motor fires and spins at rates faster then you could imagine, as well as the metal internals swelling due to heat, combustion byproducts will also contaminate the oils mix. Adding moisture, black burnt gas particles and dirt from your filthy air cleaner significantly hinders this lubricating tool. It is very important to stay on top of your engines oil and oil filter’s life. This is the last area you want to go cheap on. Your motor is depending on it and you’re depending on your motor. Nobody likes to bathe in dirty water. When it comes to HEAT I want you to keep in mind that I’m speaking of EXCESSIVE HEAT in your motor. The combustion process is Hot. We know that. Liquid cooled systems radiator fans don’t come on till temperatures are well over 200 degrees Fahrenheit. That is Hot! As metal reaches these temperatures and then cooled only to repeat this process thousands of times, it can slowly become more susceptible to wear and tear as the microscopic materials on the surface of the metals wear in . Now, with different metal compounds and the billions of dollars industries spend to rid this problem, they have done a remarkable job of making lemonade out of lemons. Along with keeping good clean oil in the motor to help the pattern, for liquid cooled bikes your coolant is vital to your bike. It’s not like your car where you refuse to change it until the radiator springs a leak. Cars hold higher coolant amounts than your bike. This means the smaller amount of lubricating compound being used, the faster they will break down. Same goes for the oil in your small motored yard tools, gas in your tanks, and brake fluids in your stopping systems. Some is good, more is better. So don’t brush off that coolant flush you have been meaning to do. Coolant has a lot of awesome minerals that keep things cool as well as help lubricate metals and seals such as your water pump. The main issue I have found is the failure to keep track of how much coolant your system is holding on a monthly basis. If coolant ever happens to reach its boiling temperature. you CAN loose it from the over flow. It turns into gas and evaporates. Although Honda motorcycles have done an amazing job with their motors ability to dissipate heat, keep this concept of maintenance in your head. These two images are from the same motor. 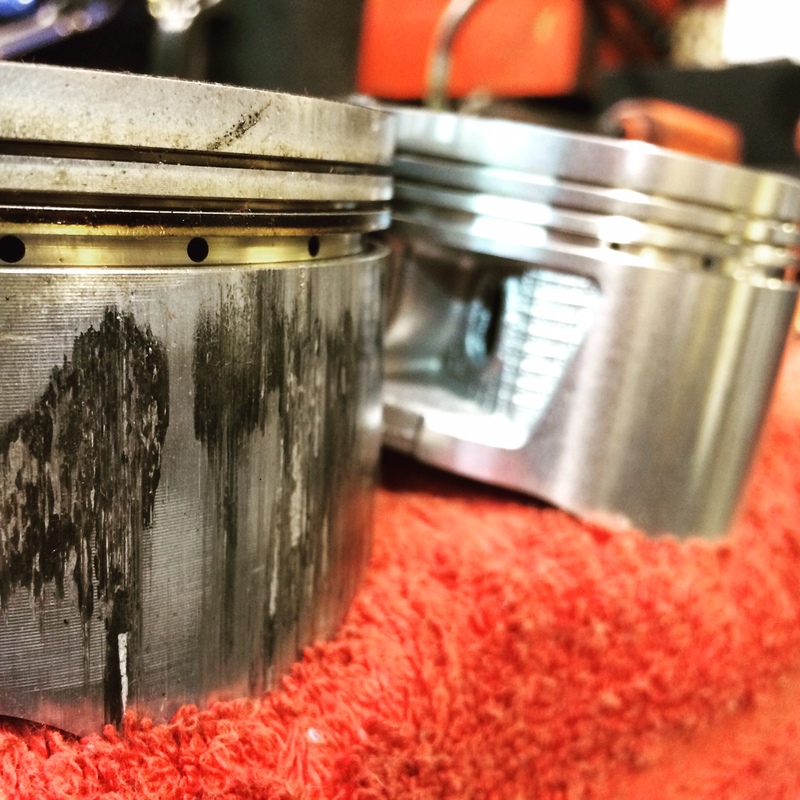 Although other factors helped bring this piston and cylinder to its demise, its a good example of what happens to metal that is un-lubricated and gets torched from metal on metal contact as it heats up which in this case seized in piston rings into their ring lands. I concluded (from knowing the back round history) that from this motors 5 year storage life. The dirty oil left in the bike along with the possibility of oil seeping past the valve guides and/or a stuck carburetor float that allowed gas to fill the cylinder dry and thicken, stuck the rings. When the bike was then attempted to be started. 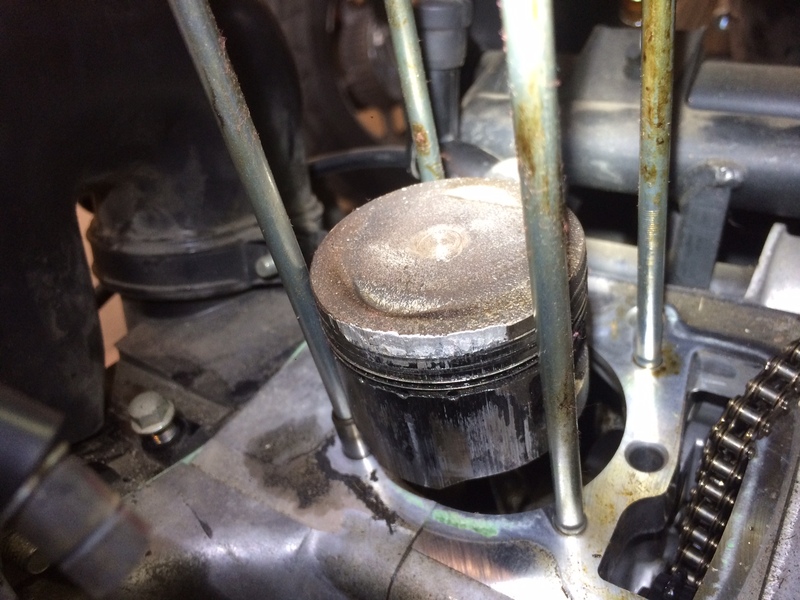 The rings never broke free forcing the piston to make contact with the cylinder. Pretty interesting! For air cooled systems it’s a different story altogether. The rate of overheating is placed in your hands. Most bikes are equipped with an overheating indicator. If you are reaching this point with your bike’s internals, then you are really putting the choke hold on your motor’s efficiency to stay in its happy place as far as temperature goes. Personally I own multiple 90’s CB750 Nighthawks. Being air cooled with only a single oil cooler (small radiator do-hickey) these bikes can overheat easily if I’m not careful. Stop and go traffic on a blocked up interstate mid August is a recipe for disaster. I’ve seen on some bikes and scooters starter motor internals melt or bind, Clutch hub bearings come to a screeching halt, as well as valve seats come unstuck from the rapid expansion. 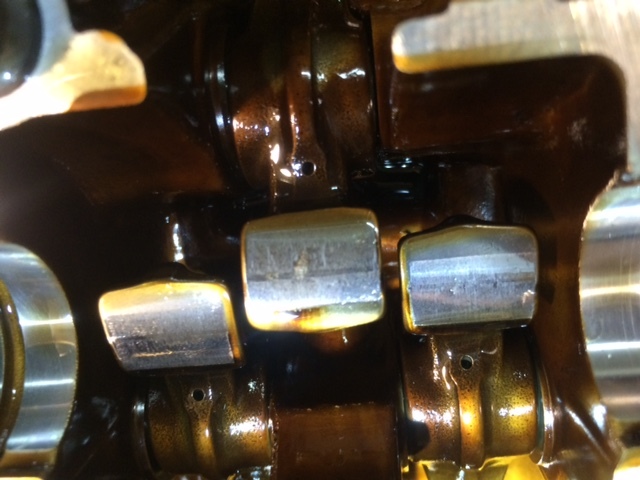 What can happen in overheating situations is that the very tight clearances in your valve trains and bearing surfaces swell. This causes even tighter clearances for oil to take up space, resulting in more metal on metal contacts inside your motor. Unwanted, UN-needed wear and tear. This goes for liquid cooled bikes as well. Like what you learned? Comment below! I would love to hear from you! Feel free to share this pages link with anyone you know! Don’t forget to follow me on my other accounts to stay in touch and up to date on any other content throughout the week!